More than 1 billion rubles (about $27.5 million) in donations have been collected over the past three years for the construction of 18 new Orthodox churches across Moscow, Duma Deputy Vladimir Resin said. 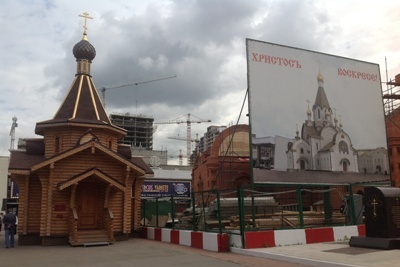 The construction of these churches fall under a government project known as “Program 200,” which aims to build 200 Orthodox churches across Moscow in the next 10-15 years said Resin, who oversees the program, Moskovsky Komsomolets reported Monday. The project was launched in 2010 with the support of the Moscow government, which allocated land and helped obtain the necessary approvals for the new builds. The idea behind the expansion is for Orthodox followers in the most built-up areas of the city to live within walking distance of the nearest church. The program has been criticized in some quarters, however, on the grounds that the money could be better spend on other projects, and that the churches are being built on public parks and squares. Others are concerned that the relationship between municipal government and the Orthodox Church, which has grown increasingly close in recent years, has led to other religious groups being sidelined in the capital.